“Brand Jamaica to the World” – That is the theme under which Jamaica’s excellence in creativity & innovation will be showcased at Expo Jamaica 2014 to be held APR 3-6 at the National Arena, Kingston thanks to a partnership between the Jamaica Manufacturers’ Association (JMA), The Jamaica Exporters’ Association(JEA) and JAMPRO. The biggest trade exposition of local-made products since 1971, Expo Jamaica 2014 (formerly the JMA/JEA Expo) continues to be the main platform for promoting ‘Brand Jamaica to the World’. There is no doubt that Jamaica is the ‘Business Hub of the Caribbean’ which is the theme under which Expo Jamaica 2014 was launched recently in the gardens at Jamaica Pegasus. Dubbed, “The Expo Jamaica 2014 Digital Experience’ attendees were given a ‘taste’ of the world class Jamaican goods & services that will be on display come APR 3-6. Premium brands present were: LIME, Red Stripe, Linstead Market, Rum Fire, Appleton Estate, Seprod, National, Serge, NCB Capital Markets, WATA, among others. The exposition, which will be held over 4 days, will showcase products from: Food and Beverage, Cosmetics, Pharmaceuticals, Fashion, Electronics, Art & Craft, ICT, Automotive, Business Development Services, Furniture, Textiles and other industries. It seeks to attract buyers from over 30 countries seeking authentic Jamaican products and services of high quality presenting real opportunities for business, trade and negotiation. The buyer experience will be a holistic one. In addition to learning about Jamaica’s wide array of services and sampling of our products first-hand, buyers will be given the opportunity to be part of a North Coast recreational tour where they will be able to relax, play golf & enjoy good food and entertainment as part of the ‘total Jamaica experience’. experience the wide range of products made locally and to continue the great support they have given the Expo over the years. Key Messages were delivered by the Hon. Anthony Hylton, Minister of Industry, Investment and Commerce; Brian Pengelley, President of the Jamaica Manufacturers’ Association; Marjorie Kennedy, President of the Jamaica Exporters’ Association; Diane Edwards, President of JAMPRO; and Garfield Sinclair, CEO of Lime, the main sponsor for the event. 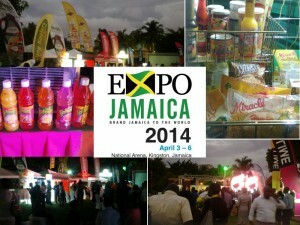 Expo Jamaica 2014 is Social!